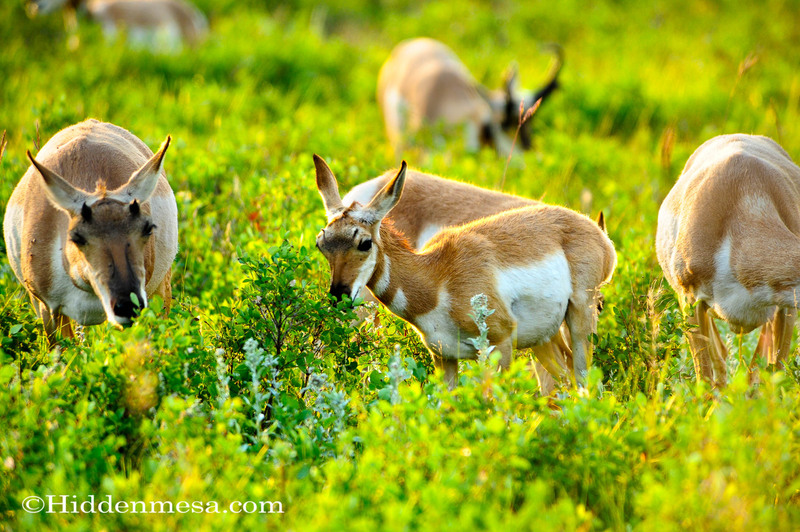 At Custer, you’ll find several different species, usually grazing herd types. 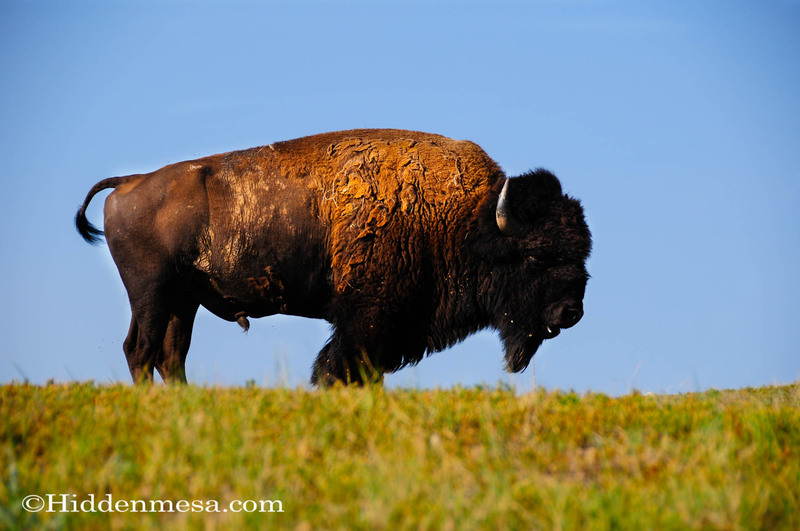 Bison, deer, and pronghorn are common. In fact, the animals that sparked the most interest for us was the pronghorn, or antelope. 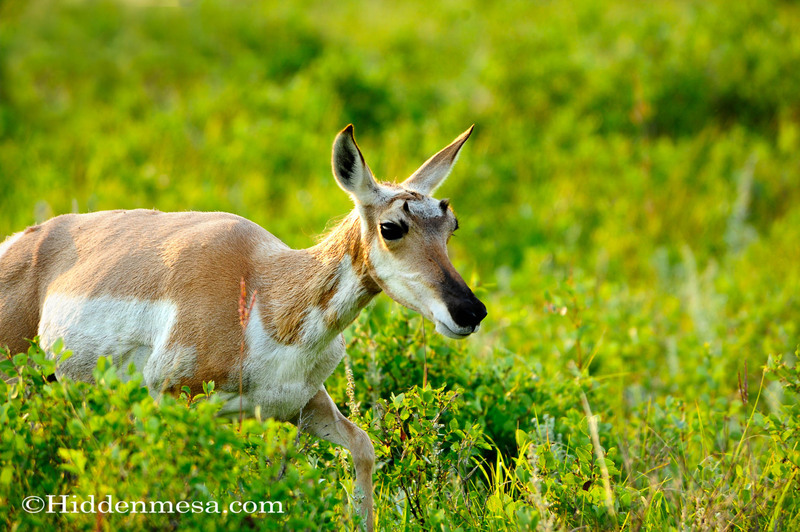 Usually you can’t approach a pronghorn close enough to get a good image. They’re too wary of people, and in fact they base their defenses on having lots of open space, and keeping a big distance from predators. In Custer State Park, all that seems to be irrelevant. We wouldn’t say they’re “approachable,” because we don’t approach animals, but they’re easily spotted, and very often they’re spotted near the roads where pictures are quite easy. Since most animals at this park are used to humans, and know that they don’t represent a threat, they’re not bothered by our close proximity. 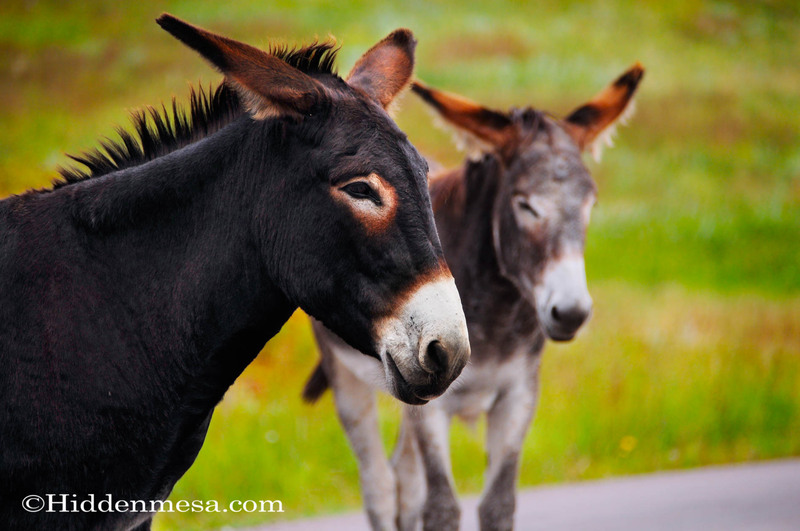 Other animals we enjoy seeing at Custer include wild burros, prairie dogs, and an occasional coyote. 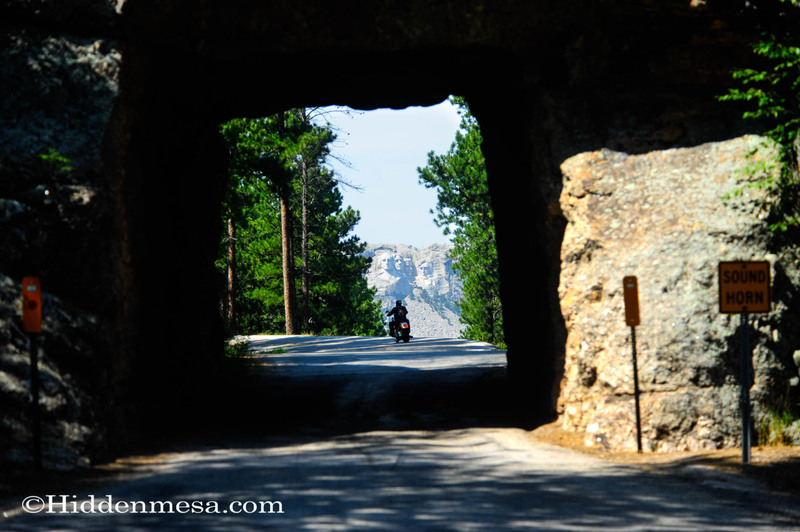 We’re usually driving up Interstate 25 out of Denver when we visit Custer State Park. From there we go up 25 to Cheyenne, then head out on State Highway 85 to Lusk, north from there on 18 to Newcastle, then right (east) on State Highway 16 into Custer State Park. There are five lodges you can stay at if you want to stay in the park. If you like to camp there are also several very nice campgrounds available. Photo by Bonnie Fink. We’ve camped at some of the campgrounds within the park using our tent, and we’ve stayed in hotels in Keystone and Custer. We’ve also stayed in some of the many RV parks in our 5th wheel trailer. 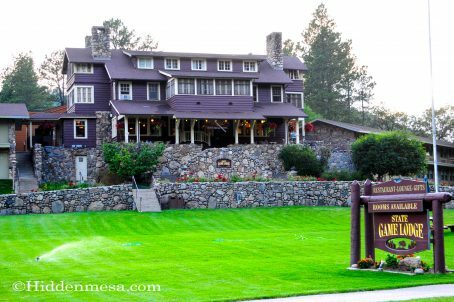 South Dakota in general and the Black Hills-where Custer is located-in particular is a seriously popular summer travel destination, so there are a lot of choices in terms of accommodations. When tent camping, we’ve stayed twice at the Blue Bell Campground. It’s a quiet state operated facility near the town of Custer. Also nearby is an active horse stable with trail riding, and a rustic lodge, also called Blue Bell. We’ve not stayed at the lodge, but the Buffalo Burger for dinner was good. There’s a general Custer State Park web site that’s a good place to start your research if you plan to go. To learn about the many lodges and cabins within the park, here’s another site to check out. When traveling with our 5th wheel trailer, we’ve usually stayed in Custer at the Beaver Lake Campground. We can’t say it was the best because we haven’t stayed at them all, but it was good, and to us, worth the money. We’ve actually stayed there a couple of times over the years, so it was good enough to go back. When staying in a hotel room, we usually have stayed in the Holiday Inn Express located in Keystone. We like the consistent good quality of Holiday Inn Express, and since we’re usually pretty loyal, we get points that translate into free nights with the chain. It offsets the price and actually makes staying with Holiday Inn Express a reasonable deal financially. 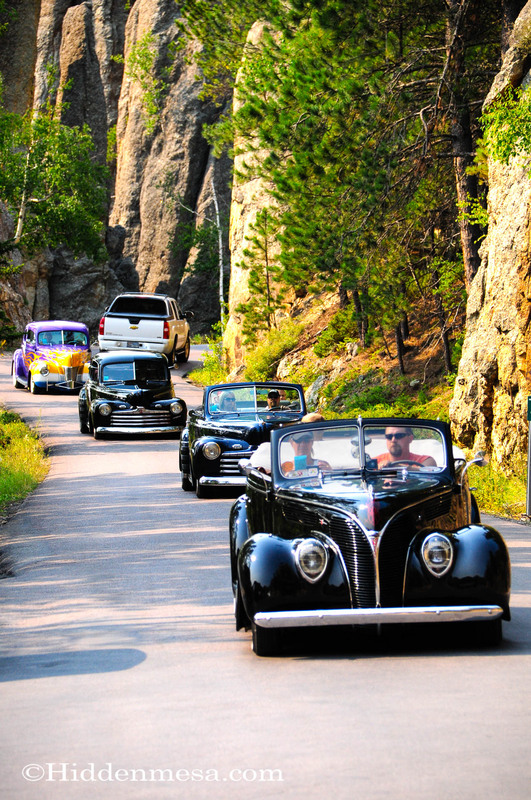 We recommend reservations well in advance when visiting Custer State Park. This location is easily as popular as some of the major National Parks, and demand on lodging and camping is high. See the next section if you might want to visit during the last part of July or first park of August. A drive on Iron Mountain road will give you a view of Mt. Rushmore. If you visit during the week of Sturgis you will also see more than one Motorcycle. Photo by Donald Fink. Have you heard of Sturgis? It’s the absolute American Mecca of Motorcycle rallies, bringing in as many as 750,000 motorcycle enthusiasts every year. We’ve been twice, and from the perspective of a motorcycle rider, it’s a unique and phenomenal experience. It’s called Sturgis because that’s the town where the activity is centered, but it’s grown so large that the entire region is engulfed in the rally. Every little town for miles around is swarming with bikes, bikers, and vendors for the period of the rally. This is not the time to show up with your 40 foot motorhome or 5th wheel. We’ve been there once with our 5th wheel, but we showed up slightly before it started, and parked the trailer and truck the entire time, making our way around on the Harley during the rally. No problem for us, but when we’ve seen folks with their trailers and motorhomes stuck in traffic in a town where the bikers are parking in the middle of the street, they weren’t usually looking happy. As we mentioned, we’ve been there during Sturgis twice, and loved every minute of the experience, but we were there with our bike for transportation. So, as we saw quoted in one publication, “If you like motorcycles, Sturgis is the first full week of August, and the weekends on either side. If you don’t like motorcycles, Sturgis is the first full week of August, and the weekends on either side.” This year (2017) that’s August 4th through August 13th. If you do plan to go to Custer State Park during Sturgis week, get your reservations for your lodging or campgrounds well in advance. We recommend a year out. Yes, we said, a year out. This event is seriously popular. You can learn more about the Sturgis Motorcycle Rally at their web site here. Dates for future rallies are listed here. Profile of an Antelope buck near sunset at Custer State Park, South Dakota. Photo by Donald Fink. This post is supposed to be about the animals, so let’s get to it. 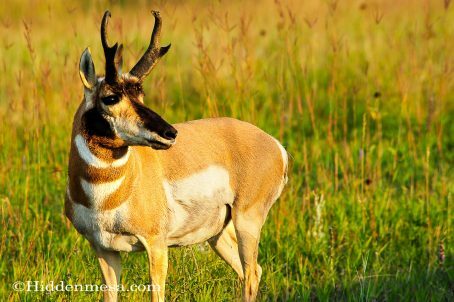 As we mentioned earlier, our reason for originally traveling to Custer State Park those many years ago was to find good opportunities to photograph antelope. We had heard that these animals were not as wary of humans as they normally are, and it turned out to be true. 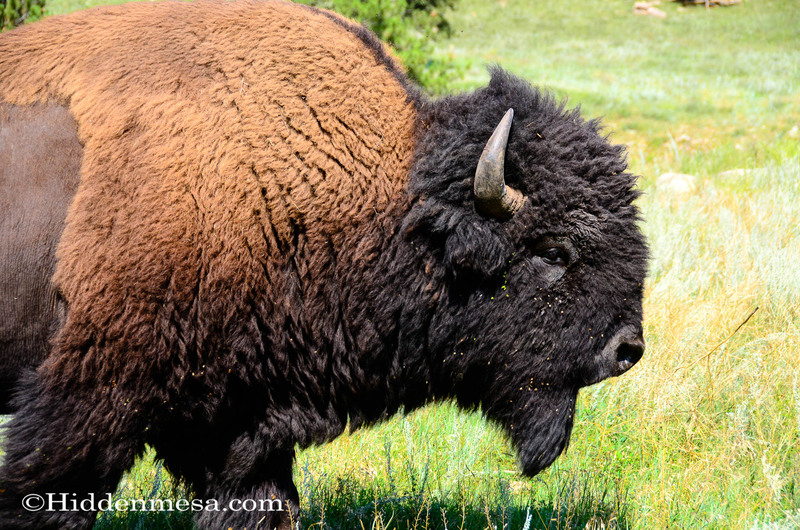 What we didn’t expect was the large number of herds of American Bison that roam the park. Yellowstone is usually known for their large herds, but Custer has got to be a close second. Actually, Yellowstone is usually home to between 2,300 and 5,500 bison. 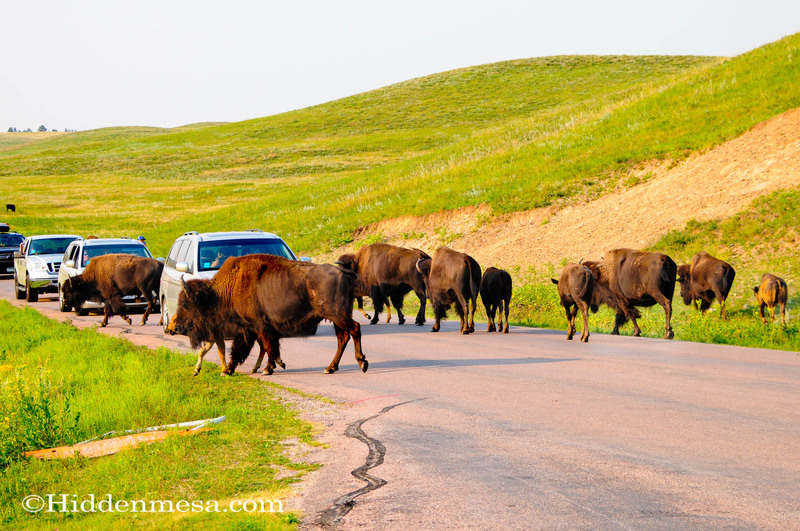 Custer State Park has around 1,300 animals. Of course, Yellowstone is 3,471 square miles in size (over 22 million acres), and Custer State Park is around 71,000 acres. The roundup is open to the public for viewing. If you’re a cowboy or cowgirl and want to participate, we have no idea how that happens, but a good place to start looking is at the Travel South Dakota web site. 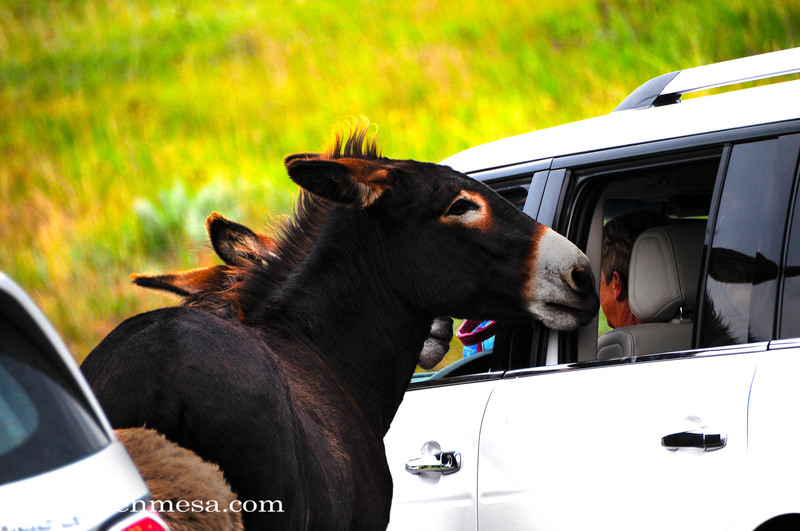 Other animals we routinely encounter at Custer, other than buffalo and antelope, are the herd of wild burros. These guys seem to hang out near the corrals along the Wildlife Loop Road. 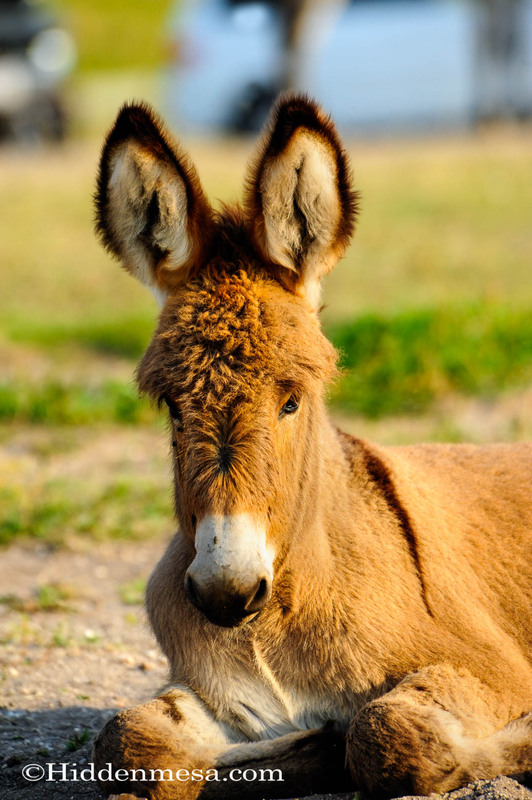 We call them wild burros, but they’re actually feral burros, meaning that they are domesticated animals that were released and have reverted back to a wild state, sort of. Keep in mind that these burros are potentially more dangerous than many wild animals. The reason is because they will approach you, not only begging for food, but in many cases expecting it. They’re fun to view, but exercise extreme caution when you’re around them. They have no fear of humans, and have learned to expect to be fed when humans are around. They sometimes get a bit on the aggressive side. Our advice? Be very careful around them, and never, ever feed them. If you do, you might not like the reaction when the feeding stops. Now please, take a moment and have a look at our images below. 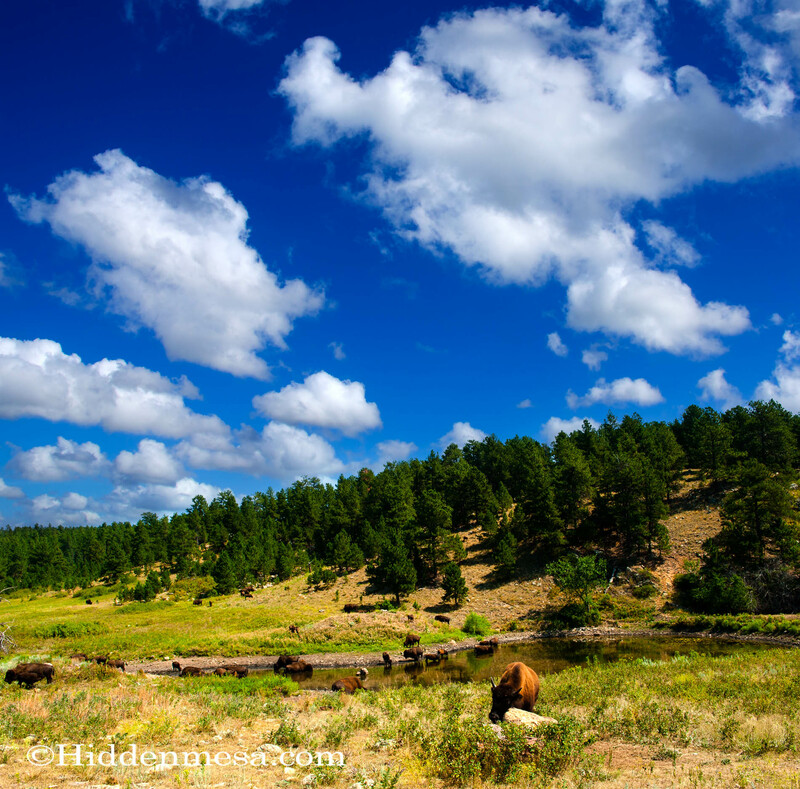 We’ve put together some of our favorites from Custer State Park. If you have an experience related to visiting Custer State Park, or just a question, we would appreciate hearing from you in the comments below. 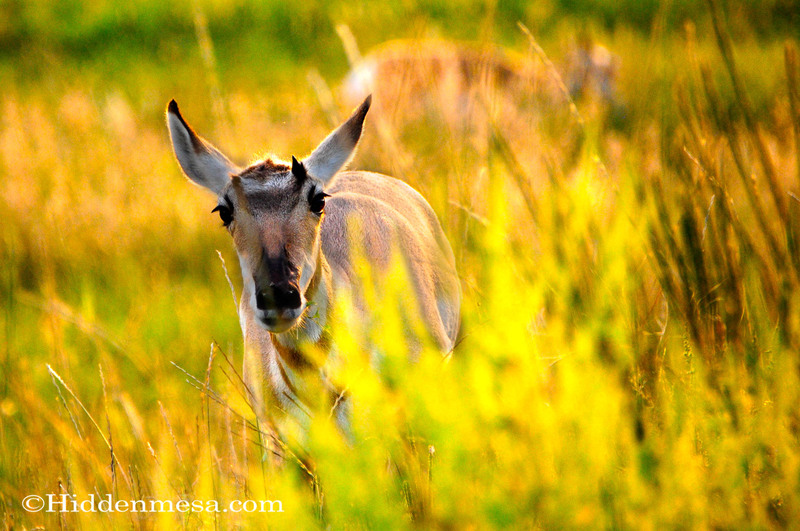 A female Antelope walking through the vegetation at Custeer State Park, South dkotk. Photo by Donald Fink. A curious antelope in tall grass. Photo by Bonnie Fink. 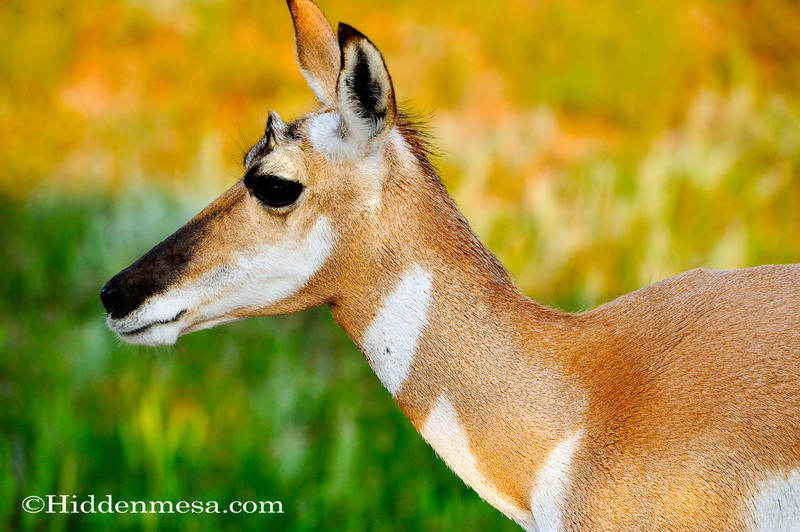 Profile of a female Antelope in Custer State Park, South Dakota. Photo by Donald Fink. Buffalo at a watering hole in Custer State Park, South Dakota. Photo by donald Fink. Buffalo Bull on a hill top, Custer State Park, South Dakota. Photo by Bonnie Fink. When the herd decides to move, they have the right away. Custer State Park, SD. Photo by Bonnie Fink. Buffalos cause Buffalo Jams. 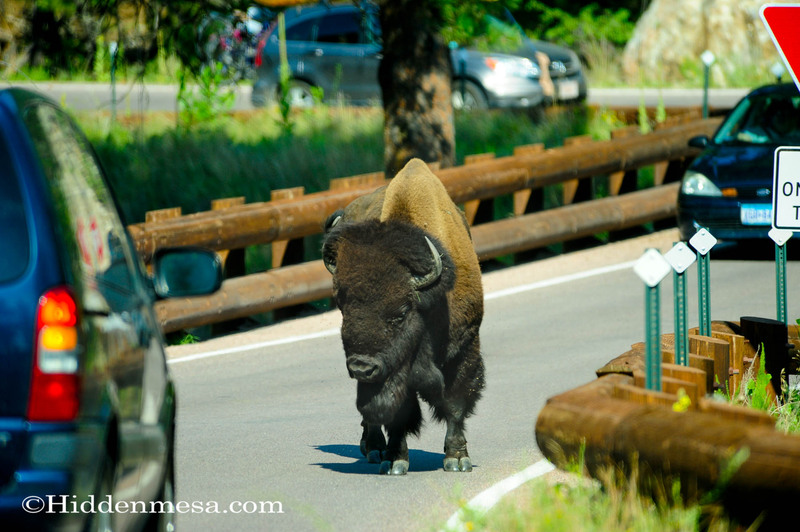 We've seen them frequently in Yellowstone and they're not uncommon here at Custer State Park. All you can do is wait for them to walk off the road, in their own, sweet, time. Photo by Donald Fink. There is a large herd of wild burros that cause Burro Jams. They love to beg for food. They'll enter your car, and yes, they will bite. Photo by Bonnie Fink. 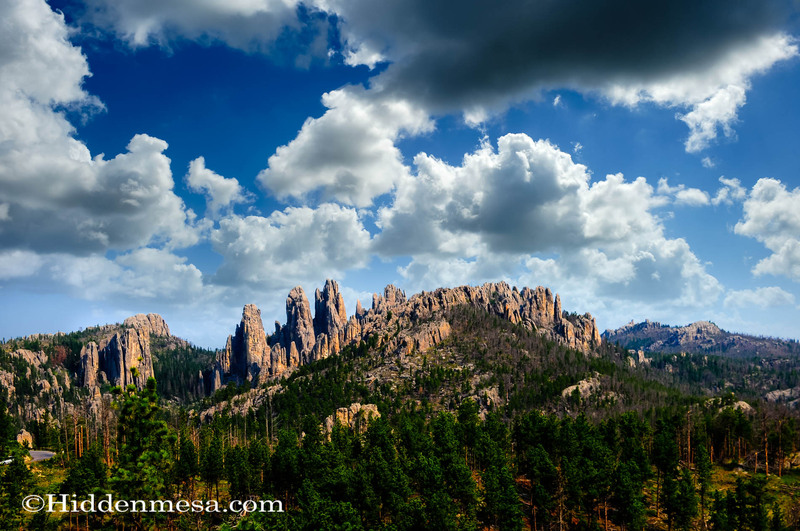 Cathedral Spires at Custer State Park South Dakota. Photo by donald Fink. You may see a classic car club taking a spin on the roads, so it's not always about the animals. Photo by Bonnie Fink. 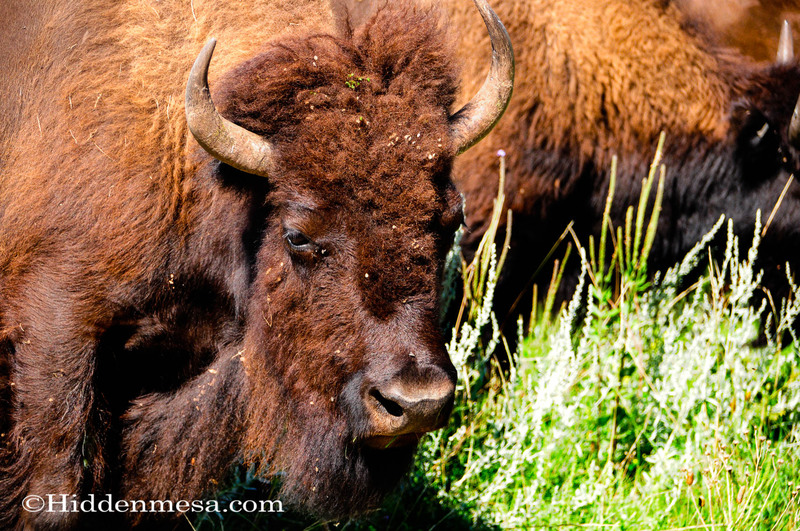 Closeup of an American Buffalo, or bison. 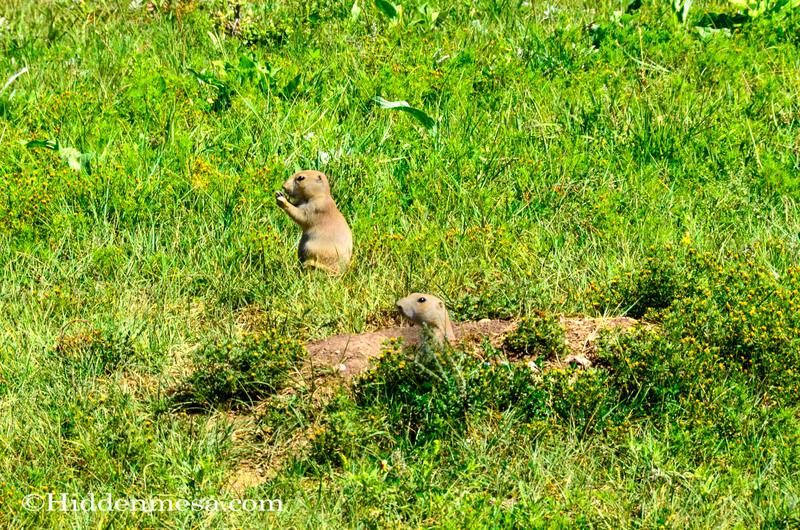 There are about 1,300 of these animals at custer State Park, South Dakota. Photo by Bonnie Fink. A white tailed fawn. Your best chance of seeing deer is if you take a drive near sunset. Photo by Bonnie Fink. Herd of Antelope grazing. 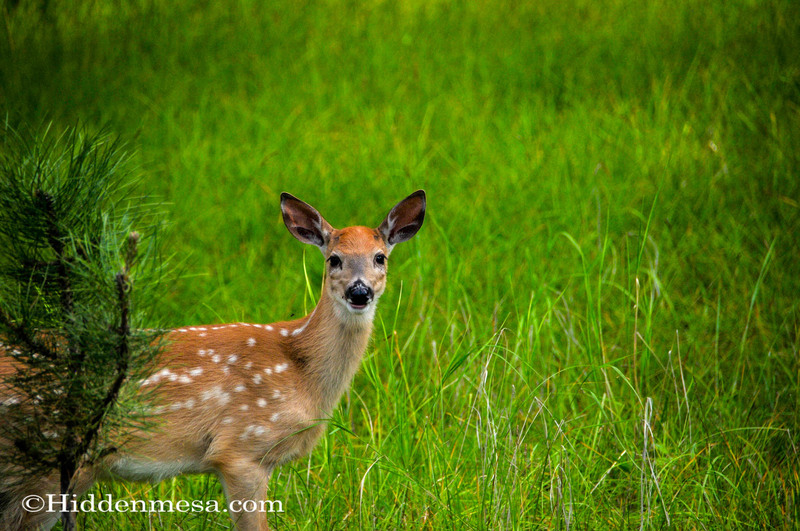 A common sight at Custer State Park. Photo by donald Fink. 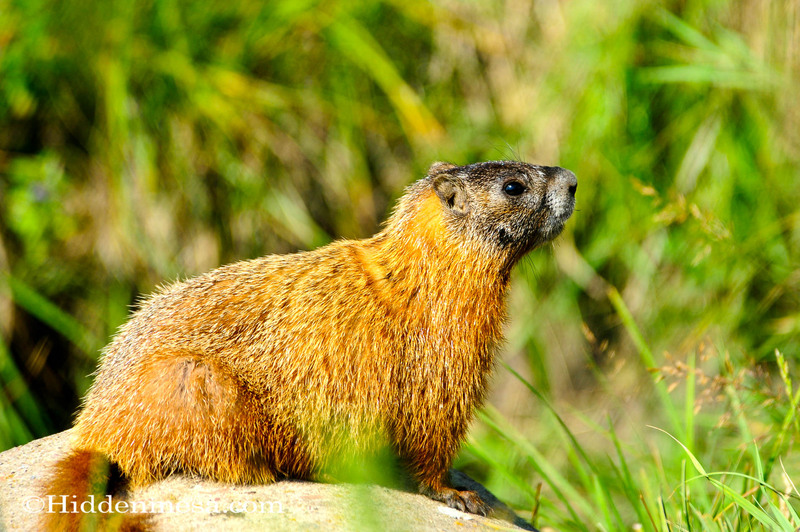 If you're really lucky you many run across a Marmot. Photo by Donald Fink. 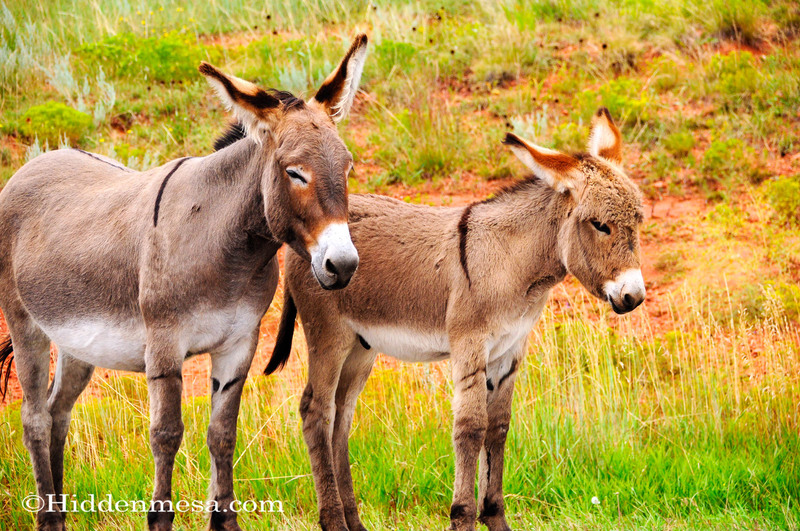 A mother and baby burro at Custer State Park, South Dakota. Photo by Bonnie Fink. A male buffalo walking through the grass. Photo by Donald Fink. 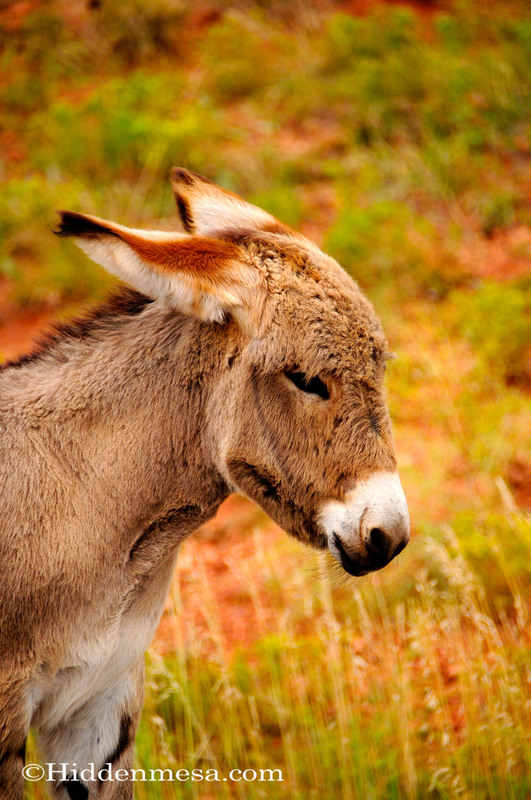 Portrait of a young burro. When the ears go back, look out! Photo by Bonnie Fink. Two burros on the Wildlife Loop Road, Custer State Park. These guys are most likely looking for a free handout. Photo by Bonnie Fink. 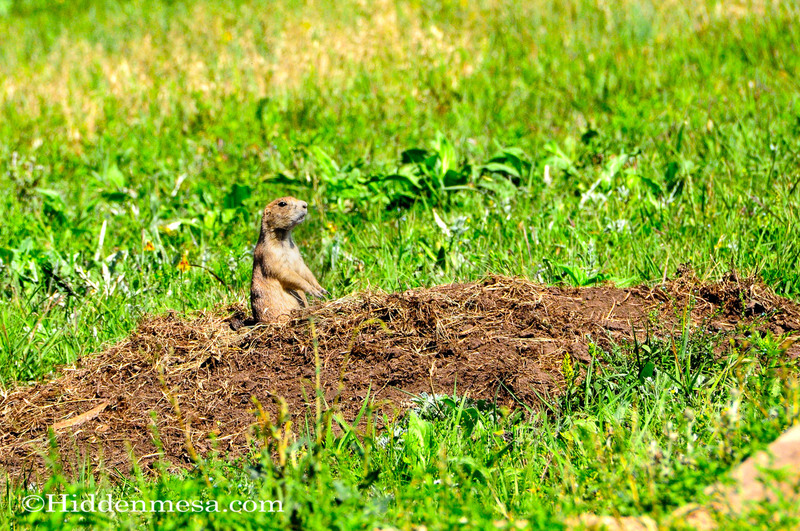 You will see many Prairie Dog towns as you drive through Custer State Park. Photo by Donald Fink. Prairie Dog standing guard duty, ready to warn others of danger. Custer State Park, SD. Photo by Bonnie Fink. 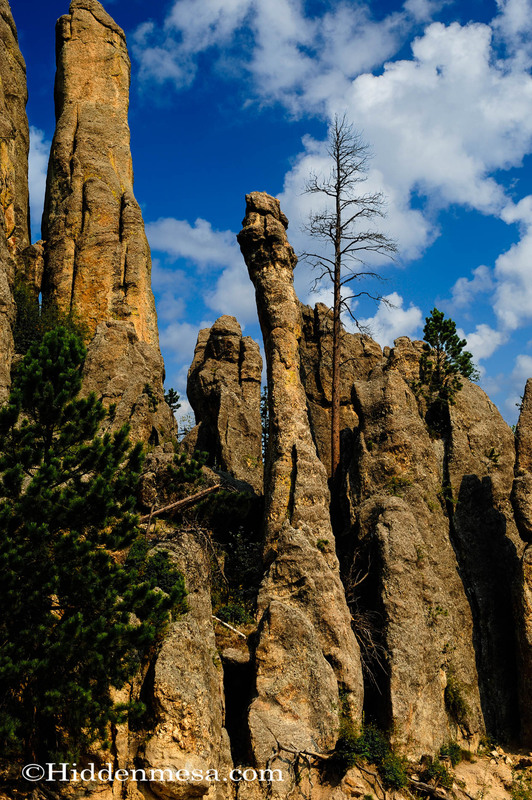 The Pinnacles, a rock formation at Custer State Park, South Dakota. Photo by Bonnie Fink. 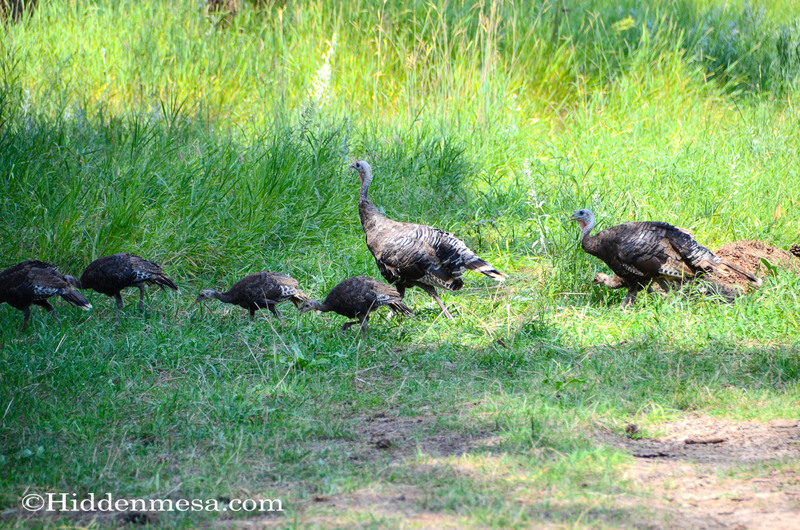 A family of turkeys out for a stroll. At Custer state Park, these flocks can be found in wooded areas where they have more coverage from arial predators. Photo by Bonnie Fink. 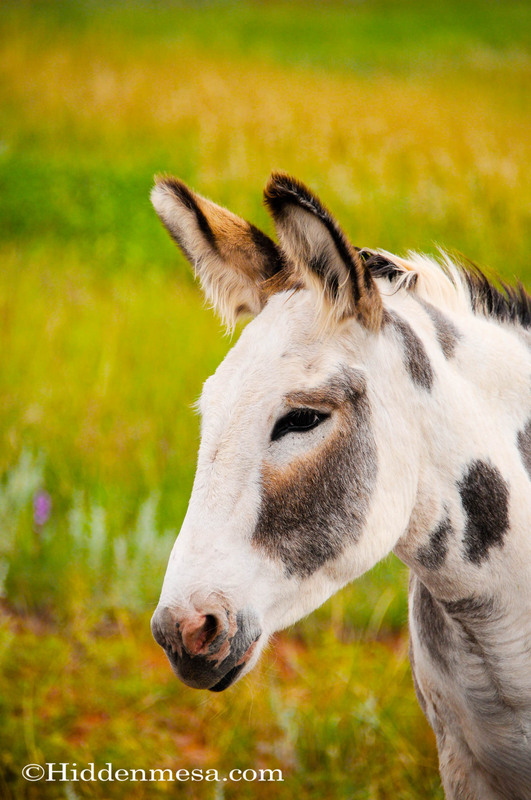 A spotted Wild Burro at Custer State Park, South Dakota. These burros are actually feral domestic burros. photo by Bonnie Fink. 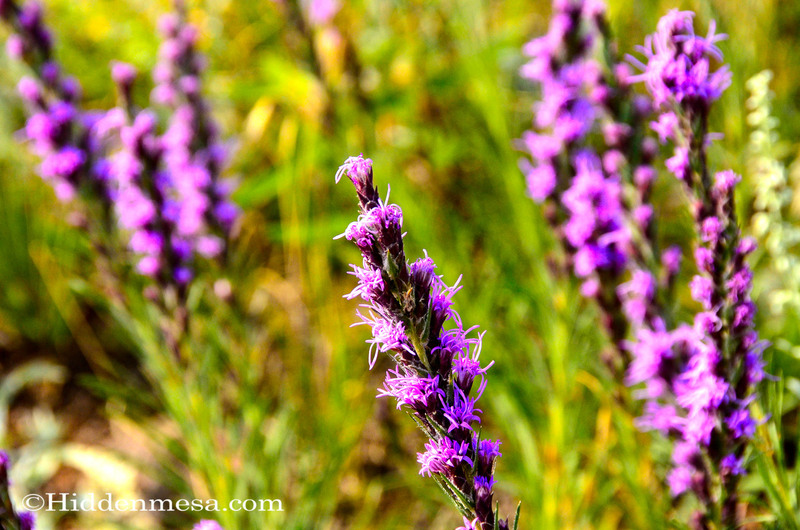 If you're at Custer State Park at the right time of year you will see fields of wildflowers. Photo by Donald Fink. A baby burro resting with his ears perked up at custer state park, south dakota. Photo by Donald Fink. 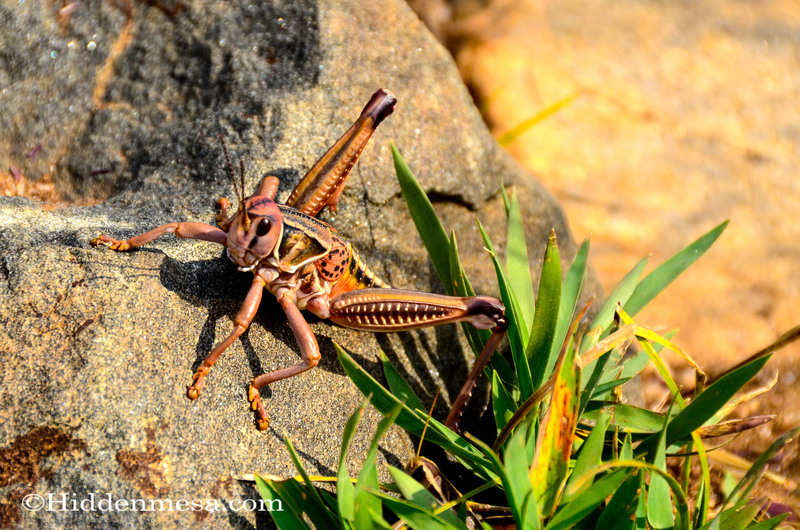 We ran across this guy while hiking, our guess is a very large grasshopper. Photo by Donald Fink.